Conveniently one hour by train from Tokyo, Kamakura is located in the Kanagawa Prefecture. Leaving my favourite hotel at Shinjuku, I arrived at Kamakura by train, not knowing much about this coastal town. I had no idea its size or how to get around. All I knew was Kamakura has a giant bronze Buddha statue, and bamboo trees at Hokokuji Temple. Thankfully, as I exited the train station, there was a Tourist Office right there. The officer whipped out a map, recommended some places of interest and general info on getting around (mainly bus), let me purchase a bus pass, and off I set off on my first destination. Getting off the bus, I bought a hot can of coffee from a vending machine and stuffed it into my jacket pocket. It was a cold morning in autumn and I had worn too little. That hot can shall keep one hand warm, hehe. Crossed the road then walked up a road straight ahead. I arrived at Hōkoku-ji Temple, to be greeted by amazing autumn foliage and quiet zen gardens. It was the second week of December and I’d never expected to see autumn foliage at all. Stepping into the temple grounds, I gasped in surprise. It was so beautiful! I almost couldn’t believe my eyes, and was at a loss between admiring the light on the little gardens with my eyes, or take plenty of photos for documentation social media purposes. Hokokuji is known as the Bamboo Temple because of its bamboo garden within the temple grounds. Though a very small garden which you can walk through within minutes, the size and sheer height of the moso-bamboo (the biggest series of bamboo) from ground up were enough to overwhelm. When the sun shines through from the top and the trees sway in the wind with a hissing sound, you feel strangely enveloped by a sense of serenity. This memory became more distinct to me than experiencing Arashiyama’s famous bamboo grove. Further in, I came across the most unbelievable autumn foliage within the inner grounds and I was breathless with awe. With such outbursts of colors among trees, plants, shrubs, a little zen garden ahead, and a little bamboo pipe dripping water melodiously into a tiny river, all my senses were captured right then. I took many photos, afraid my memory might fail me in future, before turning to mindfully appreciate the serenity and beauty in front of me. After lunch at the train station, I took another bus to visit the Great Buddha (Daibutsu Buddha). Again, autumn foliage awaits. For a small fee, you can “enter” the interior of this Great Buddha statue. It’s a small stairway (very dark – get your hp light ready), into a small landing, with signboards detailing how they built this giant statue. After walking one round behind the Great Buddha, and having taken enough photos, I left the temple grounds. Since I have no more plans for this day trip in Kamakura (read: insufficient research), I took a walk down the road, following where others seemed to be heading. Not too long after, I saw signs leading to Hase-dera, and decided to visit it. Hasedera’s temple grounds have a pretty garden and ponds, an observation deck, as well as a small cave where you need to duck to walk through. Ps: there are plenty of staircases at this place! Hasedera Temple is known for its 9.18m-tall, wooden statue of Kannon (otherwise known as Guanyin – Goddess of Mercy), one of the finest wooden statues in Japan, housed in a hall. To pray for blessings, I lit a little candle, before leaving to explore the rest of the temple. There’s a walking path consisting of many steps which you can climb up, for an elevation point where you can see this coastal town that Kamakura is. I hurriedly made my way there, getting a little afraid that I don’t have enough time to leave Hasedera before it closes! Thankfully, I made it up and down quite quickly. Komachi Street at Kamakura station (bus and train station) is a long stretch of shopping street selling snacks, desserts, souvenirs. You can also find many eateries and restaurants along the little buildings. The next time I visit Kamakura, I’ll rent a bicycle to get around! With that, I made my way back to Shinjuku, tired but very pleased with this little day trip to Kamakura! On weekends, Kamakura can be filled with many locals and tourists. I first went in 2015 and it was a very pleasant trip. Heading back to Kamakura again in Dec 2017 and it was significantly more packed with people, especially at Komachi Street and also taking the electric railway. At Shinjuku train station, take the JR Shonan-Shinjuku Line. If the train is bound for Zushi (逗子), this train will make a stop at Kamakura (about one hour’s ride from Shinjuku). If the train is bound for Odawara, you need to transfer at Ofuna station, taking the Yokosuka Line bound for Zushi (alight at Kamakura station). For other methods, refer to this page. 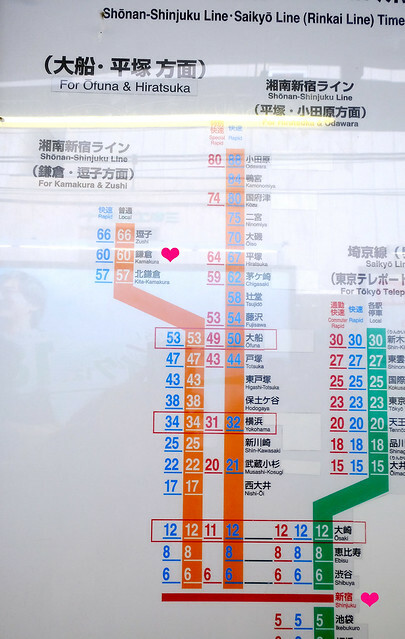 I took different buses at Kamakura station (it’s both the train station & bus station), here’s the itinerary and transport methods. Sorry, I don’t remember the bus numbers! Tip: Kamakura Free Kankyo Tegata is a useful one-day bus pass which costs 570yen/adult, 290 yen/child, available for purchase at the Tourist Office at Kamakura train station. Simply show it to the driver as you alight each bus. The bus pass is not available for sale on 1-3 Jan.
Are you intending to visit Kamakura as a day trip the next time you’re in Tokyo? • Tokyo’s cutest festival in November: Shichi Go San! Thank you for reaching out, looking forward to read more of your travels. Hi Anja! I’m so happy you came by, thank you! Kamakura indeed was a very mesmerizing place. Sorry for gushing but this is sooo pretty! Love all your colorful shots! Thanks Brooke! I love those colors.. so stunning to see them in bloom! What an incredible color spectacle! I just love autumn, would love to visit Japan in this season! The colors blew me away too!